Forecasts. In line with production programs, Ukrainian iron and steel mills are planning to manufacture 40,6 million tons of rolled metal products, 46 million tons of steel and 38,7 million tons of iron. Production of 38,7 million tons of iron shall require 53,9 million tons of iron ore raw materials, i.e. 6,1 million tons more than consumed by metallurgy last year. Lacking 6,1 million tons shall be compensated by increased up to 3,9 million tons import and the rest – by additional supplies of Ukrainian iron-ore mines, including 600.000 tons of iron-ore pellets, 400.000 tons of iron-ore concentrate as well as 1,1 million tons of agglomerate. Estimated volumes of coke production in the next year are 19,6 million tons, which shall require 31,2 million tons of coal charge. Ukrainian local producers shall be able to supply only 17 million tons of coal charge, so the remaining 15 million tons of coking coals are to be imported. Ukrainian coking plants have already signed supply contracts with foreign partners for import of 10,2 million tons of coking coals. Remaining volumes are to be covered by additional supplies from abroad. Statistics. According to data of the Ministry of industrial policy of Ukraine, last year Ukrainian steel-makers increased production of main steel, ferrous & nonferrous metal products (iron, bars, wire rod, billets, channel, I-beam, plate, sheet, coils, angle, strip) by 5-7%. Steelmaking increased to 42 million 830 thousand tons, which is 1 million 938 thousand tons (5%) more than previous year. Iron smelting increased to 35 million 647 thousand tons, which is 2 million 697 thousand tons (8%) more than previous year. Ukrainian iron and steel mills manufactured 36 million 168 thousand tons of rolled metal products, which is 1 million 768 thousand tons (5%) more than previous year. Ukrainian iron-ore mines extracted 77 million 429 thousand tons of iron ore, which is 4 million 350 thousand tons (6%) more than previous year. Ukraine produced 60 million 969 thousand tons of iron-ore concentrate, which is 4 million 214 thousand tons (7%) more than previous year. Steelmakers manufactured 49 million 743 thousand tons of agglomerate (2 million 280 thousand tons or 5% more than previous year) and 22 million 374 thousand tons of iron-ore pellets (1 million 500 thousand tons or 7% more than previous year). Ukrainian coking plants produced 20 million 1734 thousand tons of coke, which is 1 million 043 thousand tons (5%) more than previous year. Ferroalloy plants manufactured 1 million 479 thousand tons of ferroalloys, which is 050 thousand tons (4%) more than previous year. 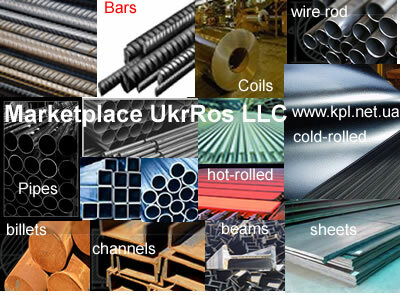 Should you need any help on import of steel, ferrous and nonferrous metal (iron, bars, wire rod, billets, channel, I-beam, plate, sheet, coils, angle, strip) from Ukraine, feel free to contact us through our web site – www.kpl.net.ua Our professional managers are always ready to assist you in this matter. Because we perfectly know Ukrainian market, we can save you a great deal of time and money, help you to make right decision and prevent fraud.